Frequent sprains to the joint complex. 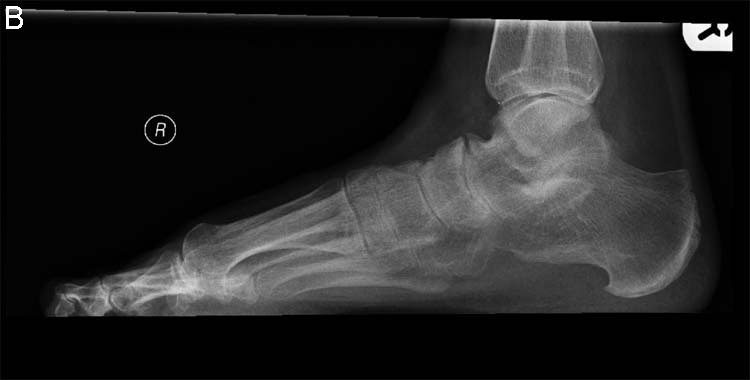 Abnormal bone connections (tarsal coalitions). Vascular necrosis of the talus. Progressive loss of motion of the subtalar joint. The difficulty with activities or uneven surfaces. The difficulty with turning the foot down and in or up and out. Diffuse swelling on the outside of the rearfoot. May be associated with spasm of the muscles on the outside of the leg. In mild cases, x-rays reveal a slight loss in the joint space. Some bone spurring may also develop around the periphery of a joint. In more moderate to severe cases, the joint space may be completely narrowed or obliterated. The joint surface on the x-ray may appear to be white, indicative of arthritic process. In some cases, CT scans are necessary to fully evaluate the injury and to assess the possibility of doing an arthroscopy. Orthotics and bracing the foot and ankle may limit the abnormal movement, lessening the pain. Moderate cases: If unresponsive to orthotics and braces arthroscopic surgery may be of benefit in removing abnormal bone and cartilage in the joint. The limited benefit will be achieved if the arthritis is advanced. 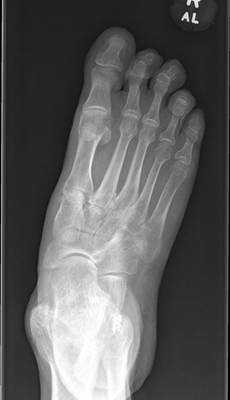 Moderate to severe cases: If unresponsive to orthotics, braces, and arthroscopy, a fusion of the subtalar joint will provide an excellent long-term outcome for this condition. The cartilage on the joint surface is removed and the two bones are fused together. The patient should be able to resume most activities following the procedure. Side to side sports such as tennis or football may be more difficult. Normal activity on a daily basis could easily be achieved following the procedure. Below is a lateral x-ray of the foot that demonstrates absent joint space in the subtalar joint with subchondral sclerosis, which are both indicators of arthritic changes in a joint. Clinically an individual may present with pain at the area of complaint of ankle pain. It is difficult to see entirely what is occurring with this condition on plain x-rays. Advanced imaging is indicated. Below is an MRI of the same foot that shows significant arthritic changes in the subtalar joint that is demonstrated with increased signal intensity (bright whitening within the black bone color) at the floor of the sinus tarsi within the subtalar joint. There is also the white color (indicative of bone marrow edema) in the adjacent talus. Pic of subtalar posttraumatic arthritis after intra-articular calcaneal fracture treated with STJ fusion. 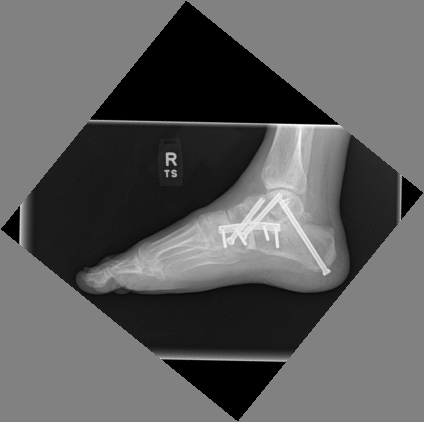 Pic of subtalar posttraumatic arthritis after talar neck fracture treated with subtalar fusion. 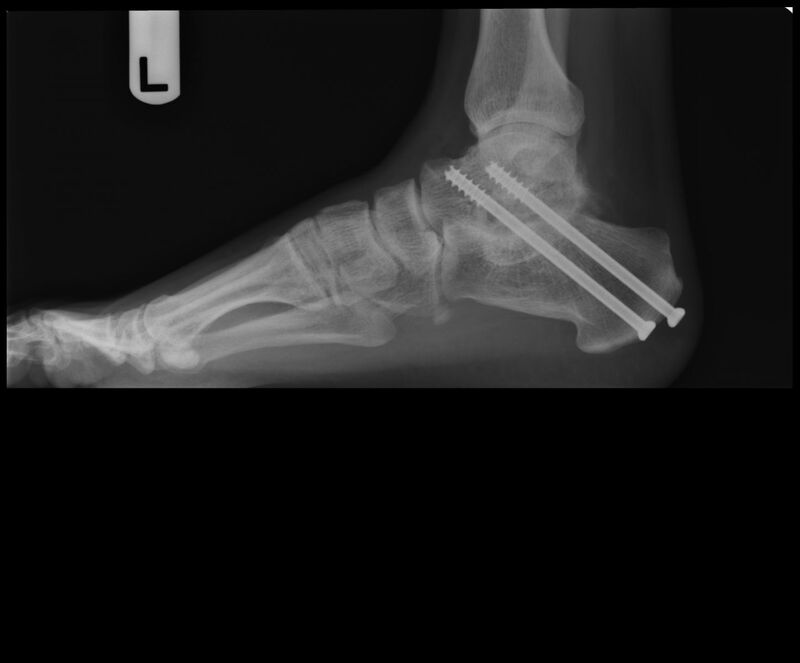 Pic of flatfoot with STJ arthritis treated with triple arthrodesis. Joints are realigned and in excellent positioning. 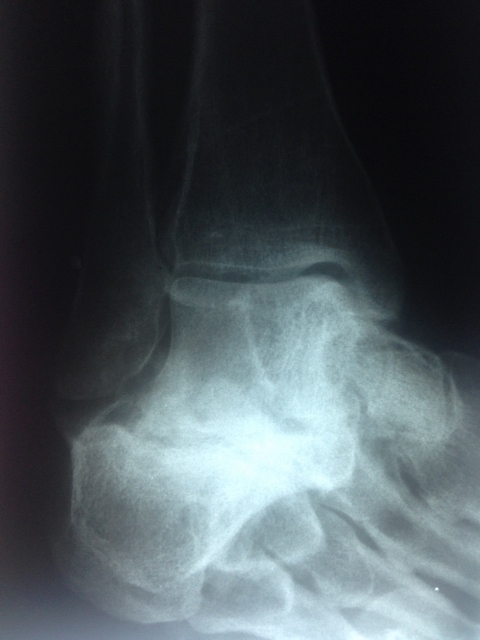 Pic of subtalar joint arthritis status post calcaneal fracture. 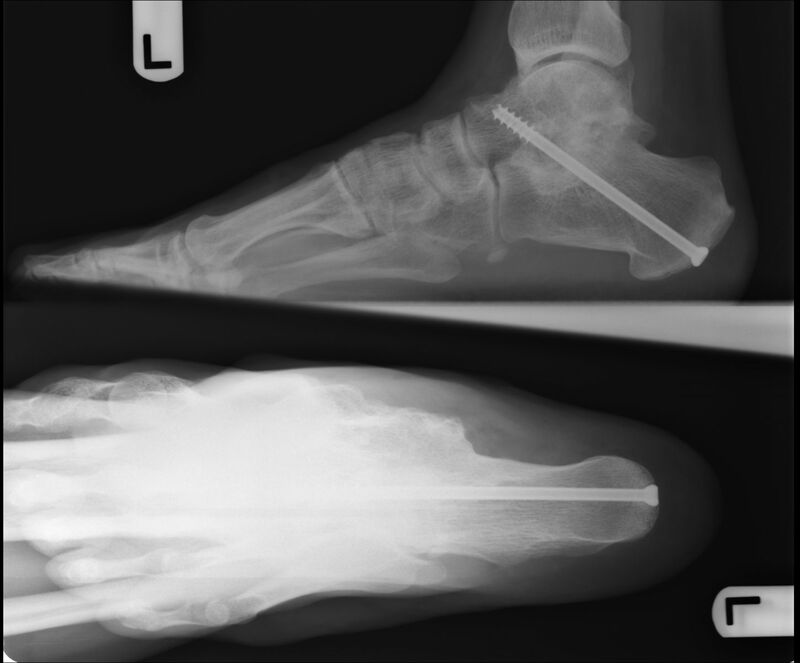 Pic of pre and postop x-rays after triple arthrodesis for adult flatfoot with subtalar arthritis. 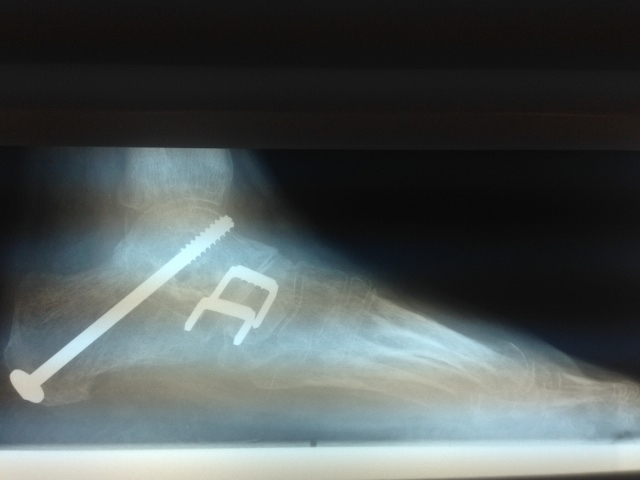 Below Preop and Postop Subtalar Distraction Arthrodesis with bone graft to maintain the height of the hindfoot. 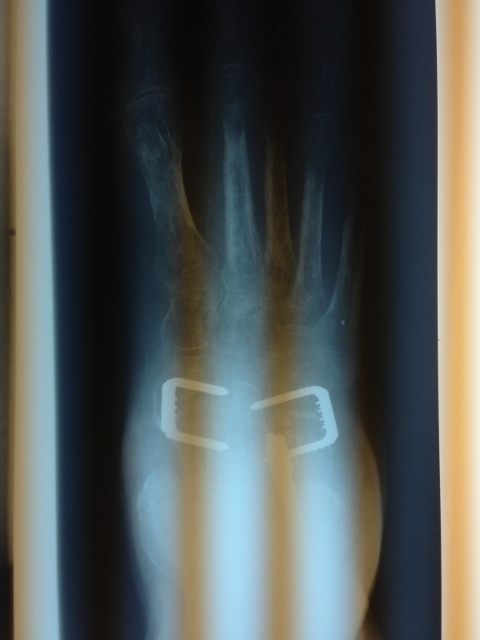 Below, Postoperative x -rays of a young patient with subtalar joint arthritis secondary to middle facet coalition. 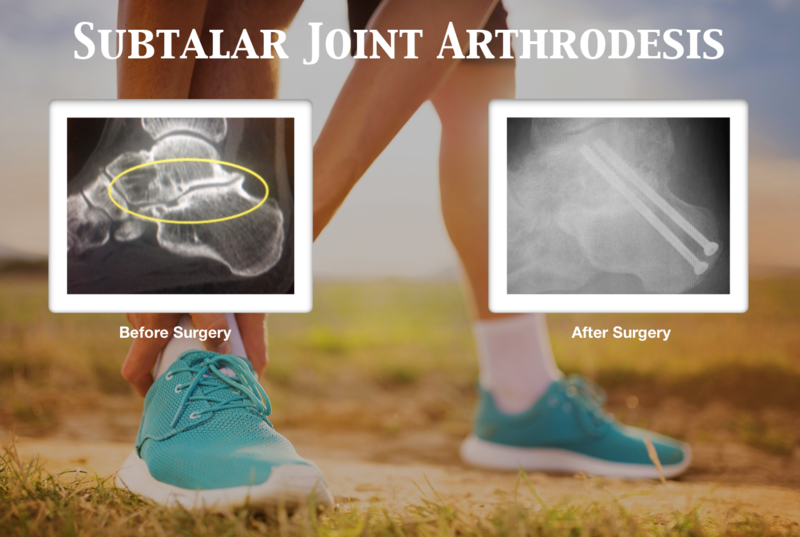 The picture on the left is one month after surgery for fusion of the joint, and pictured to the right is 6 months after surgery with one screw removed because of irritation of the screw head with shoes. Patient healed uneventfully and is doing well. 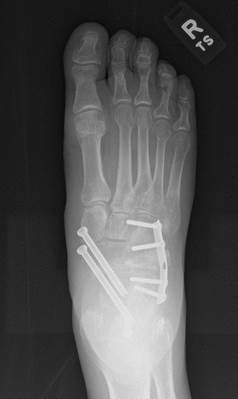 Below subtalar arthrodesis for endstage subtalar arthritis.